Brewers Association (BA)—the not-for-profit trade group representing small and independent craft brewers. our garage along the Riverwalk Trail” says Steve Sanderson, owner of RiverWalk Brewing. “We are definitely excited for what is yet to come”. median size being 1,350 barrels of in-house production in 2018. Breweries on the list range from 50 barrels to more than 40,000 and grew from less than 70,000 barrels collectively in 2017 to more than 170,000 barrels in 2018. 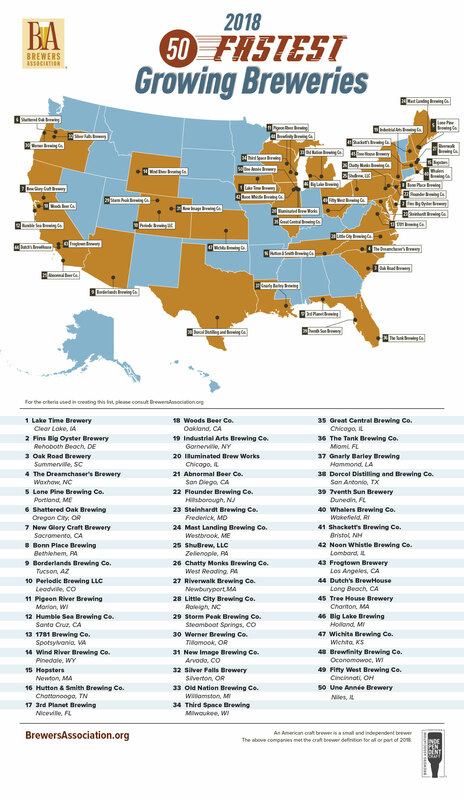 As a group, these brewing companies represent approximately 10 percent of total craft growth by volume for the year, and include 13 brewpubs, 35 microbreweries and two regional craft breweries.